Rear observation refers to a combination of mirror checks and looking behind which ensures you are always fully aware of what is happening behind you. Before you signal, change direction or speed you must know how your actions will affect following traffic. You also have to know when traffic is likely to overtake or come alongside you. Not all motorcycles are fitted with mirrors, and mirrors don’t always give a clear view behind. Looking behind is important because the view through the mirrors on some motorcycles is restricted, leaving significant blind spots. There will be times when you need to look round to see the full picture. Looking behind also warns other drivers that you may be about to signal or alter course. The lifesaver is a last check over the shoulder into the blind spot to make sure nothing unexpected is happening before committing yourself to a manoeuvre. If you are turning, use it to check the blind spot on the side to which you intend to turn. Use your judgement about when to use it. In congested urban situations a lifesaver check is normally essential, especially when turning right into a minor road. During high speed overtaking, when you are certain what is happening behind, it is often safer to keep your eyes on what is happening ahead. When should you look behind? Use judgement in deciding when to look behind. Obviously when you are looking behind you are not looking ahead. This could be hazardous if, for example, you are close to the vehicle in front or if you are overtaking at speed. Equally there are situations when it is dangerous not to look behind, such as a right turn into a minor road. Take rear observation when you about to change position or speed as you approach and negotiate a hazard. Whenever you approach a hazard such as a junction or roundabout or traffic lights, you will cope with it by going through a routine. Most people call it the OSM PSL routine but some call it “the system”. O – Observation – Check the position of following traffic using your mirrors or by looking over your shoulder when it’s safe to do so. S – Signal – If necessary, signal your intention to change course or speed. Signal clearly and in good time. M – Manoeuvre – Carry out the manoeuvre – i.e. the change in speed and/or direction – if it’s safe to do so. P – Position – Get into the correct position in good time. This helps other road users to see what you intend to do. S – Speed – Slow down as you approach a hazard. Never leave it too late. L – Look – Keep looking to assess all possible dangers. You need to know the traffic situation behind as well as in front. 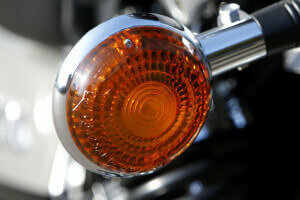 Direction indicator lamps are closer together on a motorcycle than on larger vehicles and can be difficult to see. On some smaller machines the direction indicators don’t show up very well in bright sunlight. If you think this applies to your machine consider giving arm signals. Position yourself correctly and in good time for the manoeuvre you intend to perform. A signal must have one clear meaning. For example, signalling right to pass a parked vehicle might mislead. Other traffic may think that you intend to turn right or to pull over on the right. Avoid giving signals which could have two meanings. Very few motorcycles have self-cancelling indicators. It’s very important that you cancel a signal when you’ve completed a manoeuvre. Failure to do so could mislead another road user and cause an accident. Mirrors must be adjusted to give a clear view behind. They should be kept clean and smear-free. When you’re riding you might find that your elbows or shoulders obstruct the view behind. To overcome this, adjust your mirrors to the best position. If this problem remains you can solve it by extending the mirrors with longer stems. If your mirrors vibrate your view will be distorted. 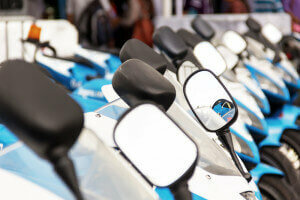 Your motorcycle dealer will be able to offer advice on how to reduce the vibration. Use your mirrors together with looking behind, when necessary. Next Section >> Moving, Stopping, Junctions.